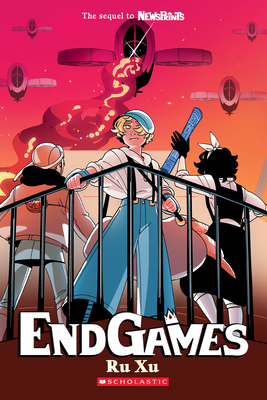 The fight for freedom and truth continues in Ru Xu's thrilling sequel to NewsPrints! Blue arrives in the capital city of Altalus, where she is determined to find her friend Crow, the boy who was created to be a flying war machine, and Jack, the engineer who built him. But soon she is inadvertently kidnapped by Snow and Red, twins from the enemy side of their ten-year war. They set off on a dangerous adventure that brings them to the front lines of the war, and eventually realize that they must work together to help end it. But with larger, more powerful forces at work, the fight for peace -- and survival -- will be more difficult than they ever imagined. Ru Xu grew up in Indianapolis and received a degree in Sequential Art from the Savannah College of Art and Design. She is the creator of the popular webcomic Saint for Rent, and NewsPrints is her first graphic novel. Her favorite things include historical fiction, fat birds, and coffee-flavored ice cream. Visit Ru online at ruemxu.com and on Twitter at @ruemxu.